A year ago at this time, only a couple of months after graduating from college, the question “Where do you see yourself in 5 years?” could send me into a tailspin of uncertainty, doubt, frustration, angst, and melancholy. My answer was usually some cobbled together and hopefully-slightly-prettier version of “I don’t know.” Even now, it’s not a question I can answer with certainty. As I’ve been getting ready to move though, I’ve been thinking about what the next 5 years might hold for me. Though they’re not quite as uncertain as the last 5 were, there are no guarantees in life–of where I’ll be, what I’ll be doing, who will or won’t be in my life. I’ve written to past me, but there are things about this time that future me needs to know and be reminded of. There is good here to be held onto. Hi there. I wonder where you are; where you’re living, who you’re living with, what you’re doing for a living, if your interests have broadened or changed since now. You’re different now, perhaps in ways both good and bad, but there are traces of past you there too–I hope they’re the good ones. So, 28-year-old me, this is what 23-year-old you needed to say. You don’t know it all. I’m sure you’ve learned a lot in the past 5 years, but remember what it was like to feel like you had the world to learn. There will always be people around you can learn from, both those who are older and more experienced than you and those you are younger and less experienced. Let them bring their gifts to the table, and learn from those gifts. Appreciate the beauty of always having more to learn. Remember the meetings, the phone calls, the emails that reminded you your job has meaning. You might not be at the same place or doing the same thing, but right now, there are moments you know you are doing good work that matters, to other people and to God. And it is lovely. Wherever you are, in whatever you’re doing, find those moments. They will be there, even if you have to search long and hard for them. Read through your old journals. See how far you’ve come? I don’t know what you’ll be dealing with, but be reminded of what you’ve gotten through before. See the ways you’ve been wounded and then surprised by the redemption God works sometimes. Use what you have learned to do things differently. Take the better path, even when it’s more difficult. Look back and see the places you didn’t notice God working at the time, and marvel at what he’s done. Embrace the unexpected. Seek it out when necessary. Maybe you have an incredibly stable living situation, job, relationships, finances, transportation, and everything else, so the unexpected isn’t playing a prominent role in your life. Go find some. Do something crazy. Be spontaneous. Don’t get stuck in a rut. You will always be too young to be boring. It doesn’t have to be big or grandiose to be exciting. Keep writing. If you have stopped, I fear that something in you may have broken, that you have believed the lies whispering, “Your words don’t matter.” They do. Even if their only value comes in the sorting of your thoughts and emotions as you write them, there is goodness and worth in that. Remember the time people have told you your words gave voice to what they were feeling or thinking but couldn’t quite express. Maybe you haven’t heard that at all between now and then, but you did once. Use your words well. Wherever you are, whatever you’re doing, whoever is or isn’t around, no matter what has happened to you–God is there. And future self? I hope we’re doing well. p.s. What would you tell future you? Tomorrow I start my first grown up full-time job, but I’m not starting it in the way I had planned. Since Thursday, I’ve spent the majority of my time in bed or on the couch with assorted icky illness symptoms. It’s not how I like to spend any of my weekends (or days, hours, or minutes), but especially not before a rather monumental life change. Maybe it was kind of a good thing though. Don’t get me wrong–if I could get those days back as healthy ones, I certainly would. I was rather miserable at times (borderline pathetic, really) and had a list of things to accomplish that not only didn’t get completed, it never even got made. My thoughts became much more concentrated on the now, and much less concentrated on the a few days from now. Which is not a bad place for them to be all the time. Even as I anticipate the half day I’m going in for tomorrow (only a half day due to lingering illness), there’s nothing I can do about tomorrow afternoon or the rest of my first work week from right now. Maybe a small bit of planning and preparation, but that’s it. Tomorrow will take care of itself. More accurately, God will make tomorrow take care of itself. Funny how feeling like you got ran over by a Zamboni can put things in perspective. p.s. Have you ever had an experience that, though unwelcome, helped put something in perspective for you? Will you share it? *Side note: Which they probably will, and if they didn’t already, thanks to the magic of social media they might end up reading this someday–hey new coworkers! Yesterday, my sister, brother-in-law, two nieces (ages 3 and 18 months), and their dog moved into my parents’ house. Which, as you may recall, is where I also live. The most people this house has ever been home to is 5. And a cat. Now it will be 7. And a dog. It’s a temporary situation as my sister and brother-in-law look for a new house, but an end date is currently unknown. Interesting times ahead, to be sure. 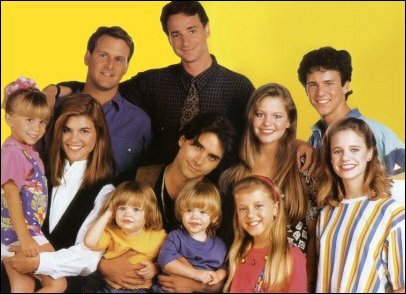 I can’t help but be reminded of the 90’s sitcom Full House, though our situation isn’t exactly the same. But with 4 more people (and a dog), the house somehow feels fuller already. Being the youngest child, a lot of this is new for me. I’ve never had anyone younger than me, and suddenly there are 2 small girls around. Laughing, playing, crying, running, knocking on my door, asking me what I’m doing. I’m trying to appreciate the opportunity that this is–not many aunts get to kiss their nieces good night every night for weeks on end, or be greeted by such cute faces when they get home from work. As with much of my life these past few months, this situation was not what I was expecting. It probably wasn’t what any of us were expecting. But, for a while anyway, this is our reality. A very full house. Lately I have been surprised, repeatedly, by the events of my life. For good and bad, and sometimes just….sideways, things have not been going as I had thought they might. Things as small as a conversation, or getting sick, or as large as getting an internship at the place I’d been wanting to work for ages. I did not see these things coming. Last week I was sick. Super sick. (I was in bed for 42 hours, unable to move even the 10 or so feet from my bed to the couch. Gross, I know.) I didn’t even have the energy to read, so I watched a ridiculously large number of episodes of TV online. It wasn’t until later, when I was finally feeling better, that I began to ponder my illness. Not in a “Why did I have to get sick?” type of way, but in a “I can’t believe I was in bed that long” type of way. Getting the flu or a cold isn’t one of those things we can see coming a long way out and plan ahead for. It isn’t something we can control, or pick when it happens so it doesn’t fall over a certain event or a really busy week. And, although I initially thought I could will myself to feel better in time for this or that, my illness did not leave room for such silly things. Lots of other things in life, both lovely ones and pointy ugly hurty ones, come along in such a fashion. Unexpected, unplanned, with no regard for whatever else is going on in life already. At times all we can do is pull up the covers and hunker down, waiting for these things to take their course. Sometimes though we are fortunate enough to be able to dance around, sing a song, and rejoice in the surprise. Or maybe, there can be some sort of good in all the surprises. Even the bad ones often carry a glimmer of hope or sunshine that we wouldn’t have noticed otherwise. Sometimes the bad things force us to appreciate the smallest of good things. Getting sick allowed me to appreciate my awesome mom (who drove out to bring me crackers, bread, 7Up, and mashed potatoes, despite the rainy conditions), a comfy bed, and funny TV shows.